“Here is the true ancient which remains vital, as given testimony in this modern response. Here is the true modern, which makes its bold advance with proud relationship to its heritage.” Robert Ginsburg, The Aesthetics of Ruins. A Studio by Architects Kamil Mrva Architects, Click here to learn more. Ruins for the purpose of this article are buildings which have been reduced to a state that bears no relation to their original purpose. They include buried cities excavated by archaeologists; sacred temples dedicated to divinities that are no longer worshipped; towers, forts, strongholds, military defences made useless by the development of new weapons; industrial plants and factories no longer compatible with modern techniques of production. For the purpose of this article we are referring to all ruins, decaying public monuments, such as palaces and elaborate tombs, and more commonplace structures, such as dilapidated houses and utility buildings. There are different reasons which underlie the formation of a ruin and different causes that trigger off the process. These include vandalism, neglect, the natural effects of climate and vegetation, and wartime destruction. The way a ruin is formed influences how it is perceived, used and eventually conserved. The term “ruin” to some produces a negative image of dereliction and decay. This is not surprising given they represent the raw realities of war, natural disasters or factory closings. However, for many they evoke overwhelming feelings of nostalgia and the realisation that such buildings have an important story to tell. Archaeologists and historians have, for many years, seen the value in what has been discarded by earlier communities and are increasingly drawing on the evidence locked into these above-ground remains to further their knowledge of how people lived, worked and died. At the same time, there has been an increasing awareness of the wide economic benefits of architectural conservation. The value of standing ruins are, not for the first time, being assessed and efforts are increasingly being made to protect and promote what has survived from earlier periods of neglect and abuse. Today, working with existing buildings, repairing and restoring them for a new function has become a creative and exciting challenge for architects and conservationists. When a building is re-used, the most influential factor in the design in most cases should be the relationship between the new and the old. The new could not exist without the old. The adaptive re-use of ruins introduces new complexities, given, among other factors, their often poor condition and/or important archaeological value. In order to be successful the significance of the ruin must be identified, understood and respected. There a number of approaches available for the treatment of ruins, to allow society to continue living with them. They can be recycled. They can be left alone to allow them to continue with the natural process of ageing. They can be preserved, treated as public monuments, and endowed with symbolic significance. Alternatively the ruins can be restored, re-constructed or re-adapted. A final strategy may be to combine a number of these approaches. When a ruin is being reused, the most important and meaningful factor in the new design is the ruin. It is the establishment of a relationship between the old and the new that is the most influential device in the new design. This can present a challenge for an archtiect as it demands a very different type of creative energy, it requires strategies that are not primarily motivated by taste or stylistic preferences. Juxtaposition: The visual impact of the new structure will depend largely on its relationship with the ruin. The alternatives include building within, on, enclosing and integrating a ruin. Some solutions may include more than one approach but predominantly fit within the one general category. Style and material: The choice of materials and styles for the new build is very important and will have a significant impact on the ruins. Rebuilding with exactly the same materials, in terms of colour and texture, is not encouraged as it may tend to produce a pastiche of the old building reducing the significance of the original fabric. Alernatives include incorporating a seam such as a coloured line of stones, or recessing the new layer, in order to clearly delineate the join. A more popular approach seems to be to provide a clear contrast between old and new materials and styles, contrasting the historic fabric against a contemporary design. Interface: The new structure must be suffciently weather-tight. Masonry ruins, paticulary rubble stonework, have irregular edges, which are difficult to add to. Existing window opening can also be a challenge as they are often stone and partly destroyed. 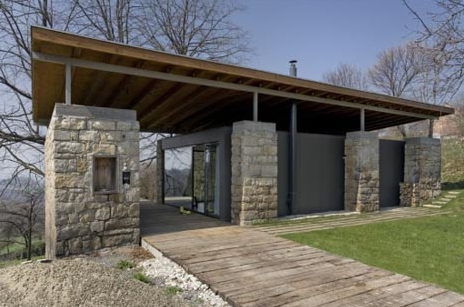 Alternatives include using a contrasting stone or capping with concrete and a soft membrane to seperate the two materials and allow for reversability. Occasionally, where there is considerable penetration and distrubance and the cohesion of fabric and archietctural details is irretrivably compromised, it may be necessary to record what is there before reducing the fabric to a sustainable state. Interpretation: As their once completed forms can no longer be experienced, ruins and their original purpose may be difficult to understand. Ruins, are links to the past and have great educational potential. For this reason, appropriate interpretation that identifies the structure’s historic and archaelogical value, is most important and should be considered as part of the re-build. The concern of conservation is the past, present and future of a building and involves making balanced judgements with regards to history, present day needs and the future sustainability. The success of an adaptive re-use of a ruin can be defined through an assessment of its historical, archaeological, aesthetic and social significance and through a value-based approach. There are various ways that a ruin can be re-adapted for a new use and the final decision as to which approach to use will depend on the acceptable level of intervention. In the case of ruins which are highly significant as a result of their archaeological or historical value, an enclosure which does not come into contact with the relic, while often overwhelming in size, will be the only viable alternative. The lack of integration and extreme contrast creates an atmosphere of separation and independency of the different objects, rather than creating a dialogue between them .The old is kept old and the new is kept new. By contrast, a ruin that is highly valued for its aesthetic appeal and where the initial visual impact is important, may benefit from a more open integrated approach. This refers more specifically to building within, building on or integrating with the ruin. These kinds of approaches may also be suitable in the case of a ruin that does not have a very high historical or archaeological value. This status would offer greater flexibility to the project allowing more active architectural engagement such as structural modification and even in some extreme cases partial demolition. The location of the ruin will heavily influence any decisions as ruins that are excavated in major cities will often be built upon even if it is not the preferred solution from the conservationist or archaeologist’s perspective. When the value of the land is so great, decisions need to be made taking into account the economics of the project. In heavily trafficked areas or areas where the weather conditions are severe, ruins may also require increased protection. Intervention will always be a matter of degree taking into account what extent the historic can be compromised by the new. It is important that the new building be readily recognised as a historically layered project, any new fabric must be readily identifiable. Only modifications related to the change of function are considered acceptable. A successful adaptive re-use of a ruin has the potential to provide a new and exciting contemporary building and/or public space and at the same time become an icon and tourist attraction for the local area. If the relic’s values have been well understood and respected, the new building can re-enforce feelings of national identity, enhance the educational value of the ruin and ensure that the ruin is secure and protected well into the future.